excellent! I'll be on today..maybe. EDIT: is it one of those servers where the creator/host has to be on? Scrubs! Get ready for a TF2 Trade offer! Selling: Mair Mask and Frymaster for 1.22 Ref each! I may see how it is. Also, @Dreysidel_ where do I play this tf2 mario cart? -Depending on your location you may have bad ping. -when you connect for the first time your going to have to wait a bit before connecting due to the fact some files need to be downloaded first. I'm trying to find a better one though..
My game has gotten stuck on halloween mode. My favorite map and server is the VGamers.net 24/7 lazytown one. Now let me rate both of these as I do for most things. Valve needs to get off their lazy butts and work on an update. Not some dumb game mode you have to spend 4.99 to play on, not canceling a map most were excited for, and DEFINITELY not a freaking reskin of he Conscientious Objector. Even the Taunt/Cosmetics looked dumb! 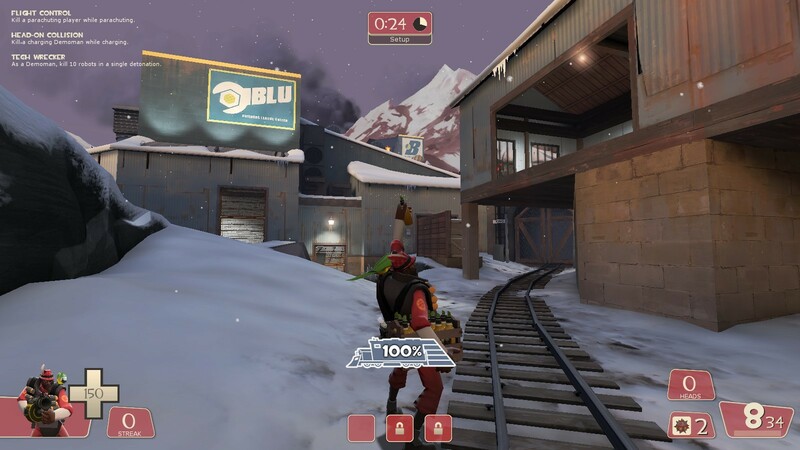 I mean, some of the cosmetics looked nice, especially the Engi/Soldier ones, but a Taunt that's meant for the SUMMER released in DECEMBER?! Holy crap Valve! Have you ran out of ideas?! Oh, remember that special map that was based off the train aspect of EoTL? Yeah, that was "Too challenging and confusing to new players". Now it'll never see the light of day. You already did a duck cosmetic for ALL CLASSES! And those "weapons" McVee promised us? Only a stupid reskin of the Conscientious Objector. This better not be the Smissmass update Gaben, or I SWEAR I'll burn down Valve HQ. I understand there's alot of negative reactions going around with this update. Obviously for most of us we didn't get what we hoped for. I honestly am having trouble calling this update "sucky" because this was a community thing like the robotic boogaloo update. We all remembered how robotic boogaloo wasn't that big. I think people getting too hyped about this update may have been its downfall. McVee is no expert in the field of weapon stats he is just an exceptional sfm movie maker/animator. After the announcement of new weapons that could get added everyone went bionicle 2015 hype on this update. It could have been too much pressure on McVee's part and ultimately this was the result. End of the Line was supposed to be an 8 minute video when it was first announced not a major update. I think McVee confirmed that EoTL and Smissmass are different. Not fully certain. But McVee had almost no say in the update. I just expected more from Valve. Just because it's not official doesn't mean it's not released. Best summary of the issues of the EOTL update I think was done in the opinion video by Muselk. In other news after just a few weeks of playing I have reached milestone 3 for demoman, engineer, and pyro. With that, pool party, and the fact I have only 2 backpack slots left after deleting duplicate weapons I really wish I could bring myself to buy digital things. The demo updates seem good. I also want to try out the new weapons, and start using the Loose Cannon some more. Question: is the Panic Attack for all shotgun classes? -The Iron bomber is pretty much a downgrade from the stock but if you have good pipe aim it can be quite dangerous. Grenade jumping is much easier with this weapon as well. -the Quickiebomb launcher is very interesting. though its a spam weapon you still need to be strategic with it. I find it more useful when paired with a grenade launcher. Its the most aggressive sticky launcher to date. Sticky jumping is kind of hard with the fizzle time. -Though i don't have the panic attack, from what I've seen its the shotgun version of the beggars bazooka. Also its very handy at low health and at close range. -The beta gamemode is very strange.....the hook-shot mechanic is very cool though as well as the power ups however, some power ups can make certain classes very OP. (ex: Haste + Heavy = you're going to have a bad time).